In our weekly meetings, the UX team kept talking about wanting to do work that mattered (charity-based, pro-bono, etc.) … something that went a little beyond our day-to-day work. We were also looking for a project the entire team could collaborate on, which we don’t get to do very often. When one of our designers noticed the Ready to Rumble competition on a local design website, we knew it was just the project we were looking for! Architects Without Borders is a Seattle non-profit organization that provides ecologically sensitive and culturally appropriate design assistance to underserved communities in the Puget Sound region. AWB launched their Ready to Rumble design competition in July 2016 in order to ‘shake up’ the way people think about earthquake emergency preparedness. The Competition Launch Party was hosted at the Lease Crutcher Lewis office in downtown Seattle on a gorgeous summer evening. 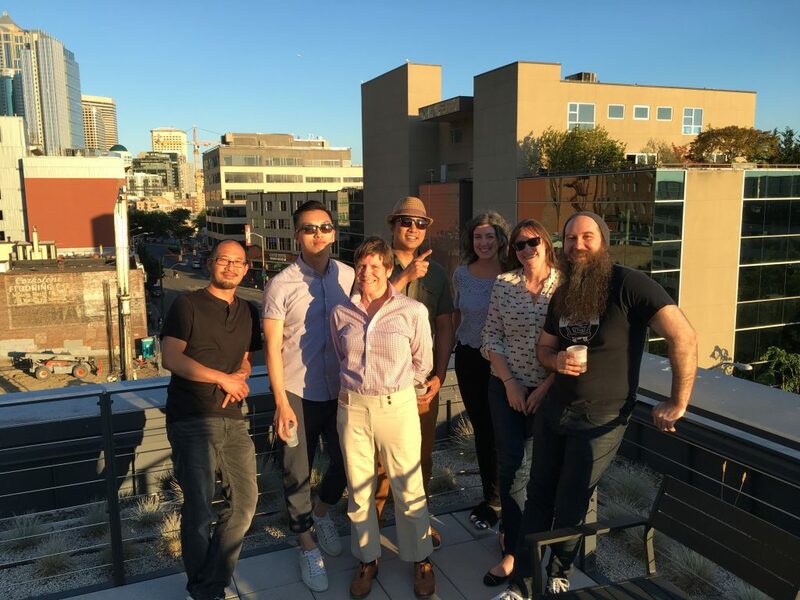 Many of the designers from the UpTop UX team attended the launch party to learn more about the competition and the potential impact that earthquakes can have on the city of Seattle and its community. For more information on project details, please see AWB’s full ‘Ready to Rumble’ project brief. Deliverable – One 24” x 36” summary board (in portrait format) including photographs, diagrams, drawings, or any other visual aid to comprehensively illustrate the merits of the proposal were due. The summary boards also needed to include a project description explaining the design goals and decisions. 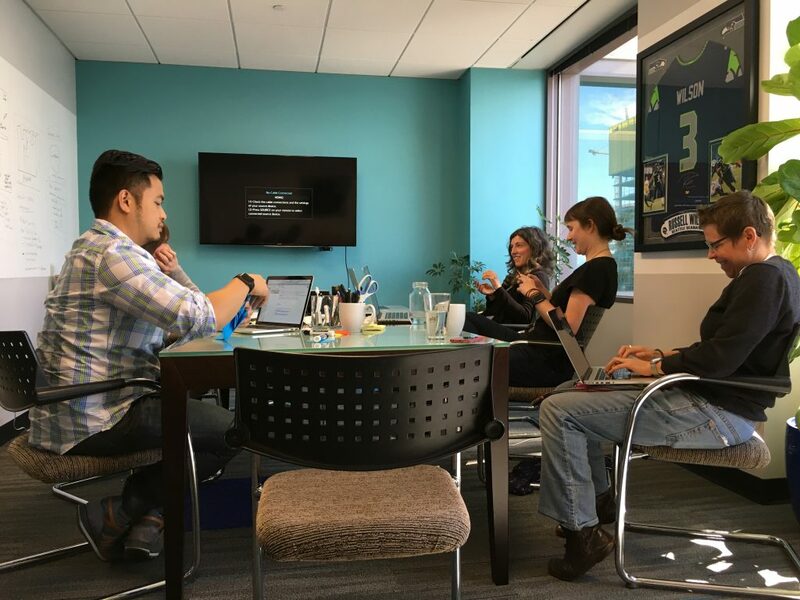 Week 1 – Internal Kick Off. Homework: Research and lightning demos. Week 2 – Lightning Demos. Individual Sketching. Focus Areas. Homework: work with your group on concepts for next Tuesday. Week 3 – Groups present concepts and take feedback / questions. Homework: consider new guidance and move to greater fidelity. Week 4 – Group updates / status. Discuss cross-over points by creating an affinity diagram. Week 5 – Decide on project / working session. Discuss prep for deliverable. 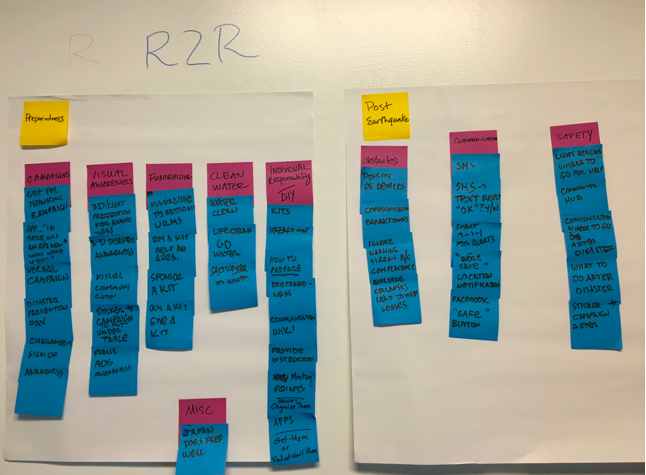 Week 6 – Finalize deliverable. Week 7 – Submission due! Everyone was asked to come with a list of products or services to review for inspiring solutions. Each team of 2-3 designers were given a 3-minute time slot to demo their solution with the rest of the team. Each demo included: What is the big idea? What might be useful? Captured solutions were drawn on the whiteboard. After all demos were competed, the team then voted on their favorites. Next we created an affinity diagram, which is used to sort large amounts of data into logical groups. Themes from our Lightning Demos activity in Week 1 were identified and written on sticky notes, which were then sorted into like-categories. During this exercise, we noticed items fell into either earthquake preparedness or post earthquake awareness. The following themes evolved out of our affinity diagram and ideation meetings. 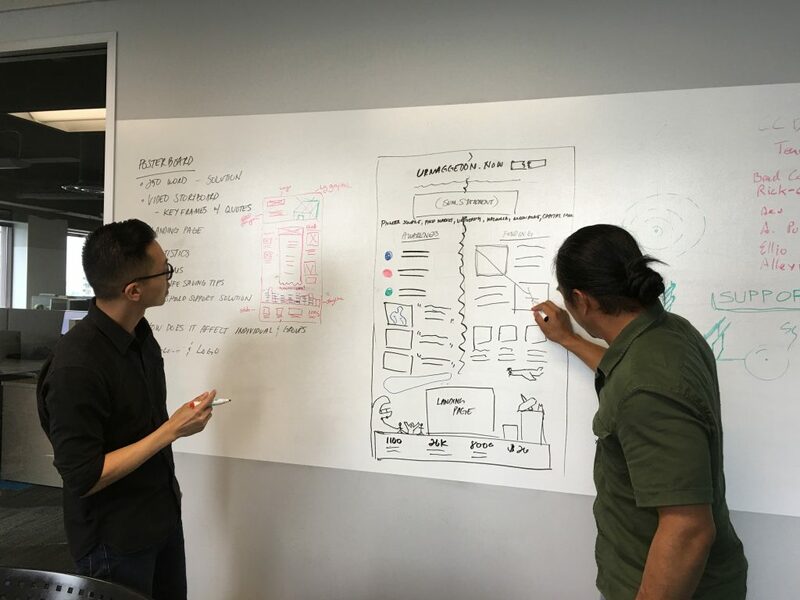 We wanted to pick something that would do well on the judging criteria (Effectiveness, Adoption/Implementation, Equity/Accessibility, Creativity), something that everyone could contribute to, have a wow factor, and that we could create visuals for in a month (6 hours / week). Protect Seattle from The Big One (Retrofit Campaign): Focus on preparing all buildings in Seattle for the earthquake (URMs). Building / bridge collapses are highest cause of death in earthquake. Individual / School Preparedness Campaign: Focus on individual preparedness and increasing the number of people who have a plan and kits ready for if the earthquake happens. Neighborhood Planning / Relief Coordination: Focus on helping a local area coordinate volunteers, supplies, shelter, and helps people find loved ones after a disaster. Could be used for disasters anywhere. Focus on Kits: Specifically focused on creating a long-lasting, easy-to-store, useful kit for home preparedness. These kits must be easy to buy for both the home and office, as well as have an aesthetic appeal that we felt many kits miss the mark on. 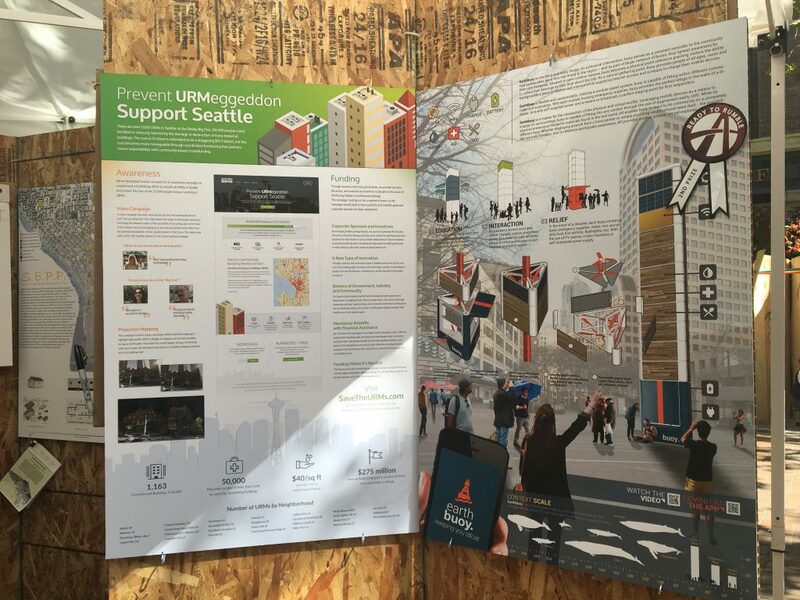 After much discussion and several activities, we decided on a Crowdfunding and Awareness Campaign that focused on retrofitting Seattle’s unreinforced masonry buildings (URMs) for an earthquake. Through research, we learned that building / bridge collapses are the highest cause of death in earthquakes and that there are 1,163 URMs in Seattle. We developed several concepts for an awareness campaign that would complement a fundraising effort to retrofit all URMs in Seattle and protect the lives of the 23,000 people living or working in those URMs. To enhance fundraising efforts and awareness, we created a video campaign that asks, what would you do if the earthquake struck now? Are you prepared? We suggested that funding come through business and local partnerships with the City who would provided services, discounts, and products as incentives to donate to the cause of reinforcing Seattle’s unreinforced buildings. Once we decided on our theme, we needed to come up with a tagline that drew people in. Retrofit an URM – Save Lives! 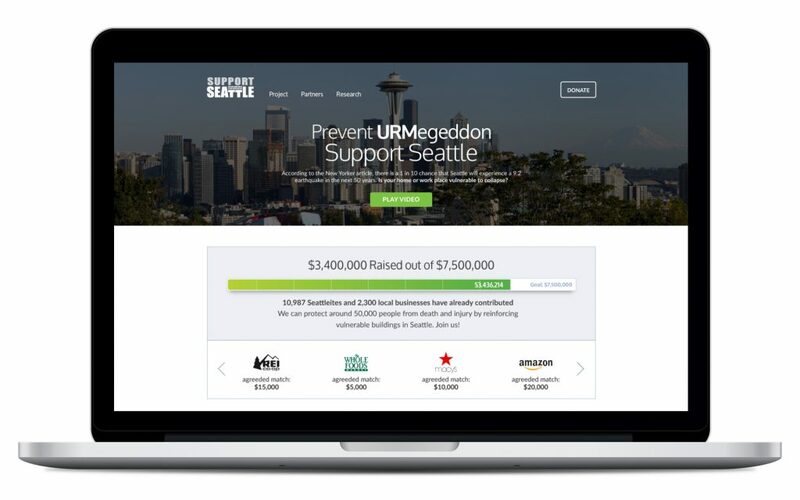 The team decided on the theme “Prevent URMageddon, Support Seattle” and prototyped a website of what a community-powered awareness and fundraising portal for Seattle’s unreinforced masonry buildings (URMs) could look like. The final poster was created, submitted and presented at the Seattle Design Festival on a sunny September day. There were a lot of great ideas and although we didn’t win the competition, we did learn a lot about earthquake preparedness/awareness and had a lot of fun collaborating as a team. 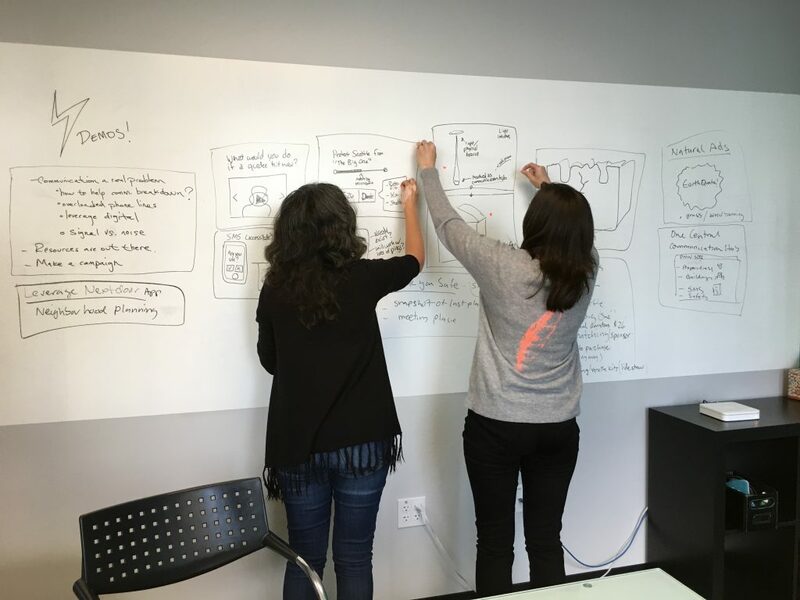 The team benefitted by delving into the design thinking methods we applied to our process.